This project provides for modification of existing facilities to construct a full scale electric drive test facility. 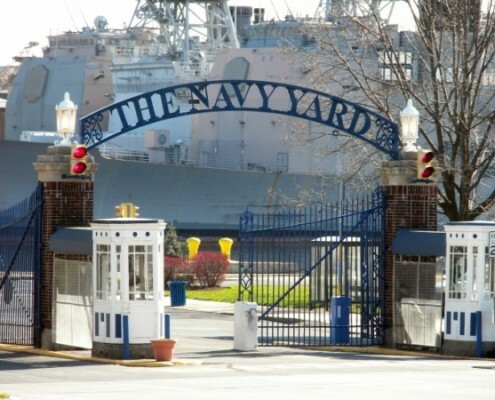 The functions contained within the facility will be comprised of testing facilities for future Integrated Power and Energy Systems and components, including electric drive propulsion systems for shipboard systems. Hatzel & Buehler will install the electrical utilities including a 30 MVA transformer and two 13.2 KV, 60 MW substations, and special construction features including an interconnecting underground 12-way electrical utility facility (duct bank and cabling). Power sources will be derived from gas turbine generators in the Building #77H complex. Gas turbine generators, steam turbine generators and fuel cells in Building #633 and utility feeders will be utilized. Photo courtesy of Philadelphia Industrial Development Corporation (PIDC).